Okay, so it's 1492 and some Italian guy named Cristoforo Colombo (Cristobal Colon in Spanish) has received the blessing of the King and Queen of Spain to sail across the Atlantic in search of a route to India. He missed it by several thousand miles, but did discover a bunch of islands in the Caribbean Sea. Of course, the Taino and Caribe people had already been living on these islands for a very long time and had no idea they were in need of being discovered. In any case, the arrivals of these alleged discoverers turned out to be disastrous for the native landholders. Thus, whether you perceive ol' Chris as a famous explorer who had the courage to cross a vast expanse of water in not much more than three over-sized rowboats with sails, or as an infamous destroyer of native culture in a brave new world, is a choice for you to make. To continue with the Who's in the Grave search, it was on December 6, 1492 that Chris found a chunk of land in the Caribbean and dubbed the island as Hispaniola. 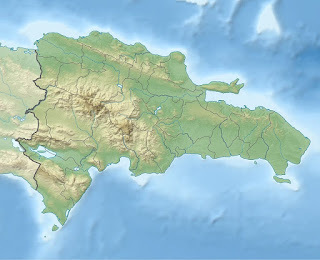 To us modern folk, we know it as an island composed of two countries; the west one-third being Haiti and the eastern two-thirds being the Dominican Republic. Actually, Chris landed on the Haiti side, but to him, it was just one island. At the time, he had no idea of the wars, civil wars and division that was to come. The Spanish used Hispaniola for their first seat of colonial rule in the New World. Because of wars in Europe among various countries, the ownership of islands in the Caribbean often changed hands. During a war when the French got involved, Spain ceded the western portion of Hispaniola to France. This part then became known as Haiti. Revolutions and civil wars finally decided languages, borders and governments for both new countries. On at least two occasions, the U.S. later stepped in to quiet things down. Back to Chris. In 1504, after his fourth voyage to the Caribbean, Columbus returned to Spain an ill and infirm man. He died in 1506 and was buried in the Spanish city of Valladolid. Dissatisfied with the burial site, his son Diego had Chris' remains dug up and transferred to a monastery in Seville where he rested until 1542 (or 1537, depending upon who you believe). The remains were then disinterred along with son Diego's bones and both put on a ship to Santo Domingo (Dominican Republic). The new Cathedral of Santa Maria la Menor was to be his final resting place, but after a quarter of a century of peace, ol' Chris was destined to take up travel again. In 1795, France took Hispaniola from Spain, so Chris' remains were removed to Havana, Cuba. Then during the Spanish-American War in 1898, Chris once again took ship. 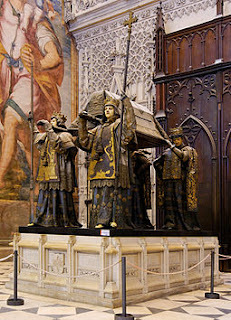 He landed in Andalusia and was interred in a tomb at Seville Cathedral. And just when everyone thought the matter was settled, we have to back up to 1877 when a worker in the Cathedral de Santa Maria la Menor discovered a lead box of bones. The box was inscribed "The illustrious and excellent man, Don Colon, Admiral of the Ocean Sea." So, it's possible that some industrious Dominican had swapped in a different set of bones and the Spanish unknowingly took the wrong ones to Cuba in 1795. After all, Chris had stated before his death that he wanted to be interred in Hispaniola. One small problem with the inscription on the lead box, his son Diego was also known as Don Colon, Admiral of the Ocean Sea. Today, two countries claim to have the burial site of Christopher Columbus. In 2003, to prove up their claim, Spain had the bones in their catafalque tested. The DNA results published in 2006 confirmed a close match to Chris' brother Diego. (Both son and brother had the same first name of Diego.) To bolster their side of the argument, the Spanish also had well documented travels of the remains, although some scientists did not think these bones were those of a man who had suffered from severe arthritis as Columbus was known to have endured in later life. As for the Dominicans, citing respect for the dead, they declined to have their bones in the lead box which was held in their newly built Columbus Lighthouse disinterred for DNA analysis. That leaves the world to wonder if the bones in the Dominican Republic are those of a stranger, those of his son Diego, or if some of Chris got left behind way back in the 1795 Cuba trip, meaning at least part of him got his wish to be interred in his old Hispaniola. Regardless where Chris ended up, the guy sure got a lot of frequent cruise miles. As for my experience in the Dominican Republic, our snorkel excursion was cancelled due to rough seas, so we did our own brave new world exploring and went zip lining for our first time ever. As I mentioned last month, I am pleased as punch to have a story in Murder Under The Oaks, an anthology published in October to celebrate Bouchercon, the annual mystery convention, held this year in Raleigh, North Carolina. 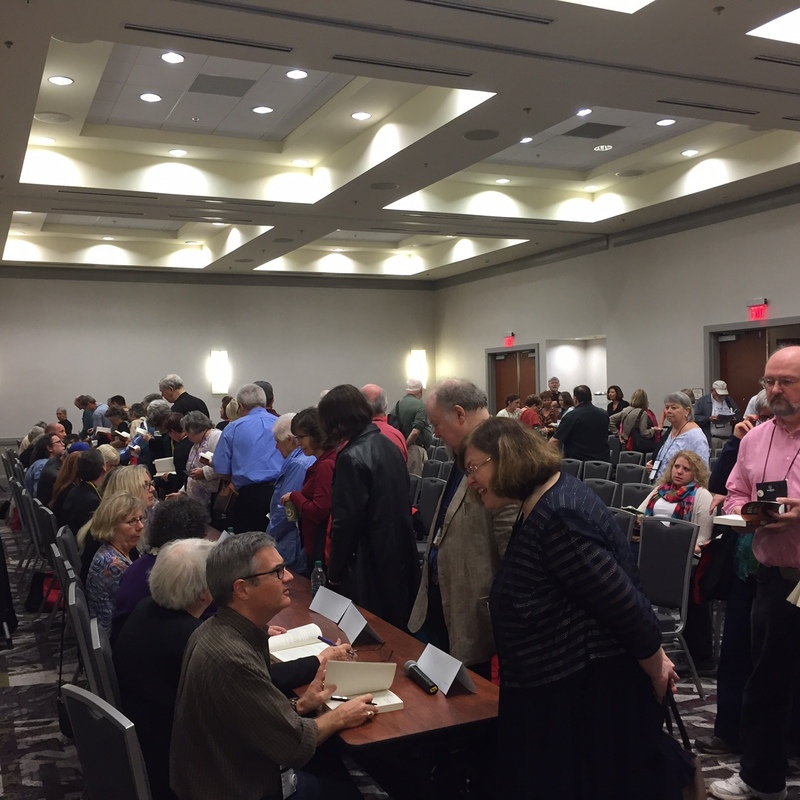 I am also delighted that the profits go to Wake County, NC libraries. How can I argue with a cause like that? This photo shows me at the end of the assembly line, eighteen or so authors signing their stories. I'm the last guy because my story ends the book. When I heard about the proposed anthology I went through my old files, searching for an appropriate piece. I was happy to give a story to charity, but only one that had already been rejected by the major markets. This doesn't mean there is anything wrong with the tale; most of my stories that have been nominated for awards were rejected at least once along the way. I settled on "On The Ramblas," which is set in Barcelona. (Well, I don't have any set in Raleigh... yet.) I pulled up the file for an edit and decided the plot was fine and the writing was okay, but immediately the question of theme came up. Eileen Gunn said that "'Theme' is what the critics use to describe what you did." Someone else said theme is what the story is about other than the plot and the characters. I prefer the latter definition. Usually I don't know what the theme of a story is until I am in the final edits. That's when a sentence in the text will pop up in front of me and I'll think: Oh, THAT'S what it's about. But in the case of "On The Ramblas" I knew early on that the theme was: What does it take to make you happy? My story is about two American tourists in Spain. Frank is miserable because he would rather be back home making business deals. His wife, Helen, is unhappy because Frank is making sure she is. My third character, Josep, is a Catalonian pickpocket, and he is brokenhearted because his girlfriend left him, taking his team of thieves with her. He is not only lonely (say that three times fast) but he is trying to do his job without the proper co-workers. What will happen when these freight trains of unhappiness collide on the Ramblas, Barcelona's main tourist shopping street? So I thought I was all set in the theme department. But as soon as I sat down to revise I realized that there was a second theme, begging to come out and play. It was right there in the first sentence: Tourists wandered through the Ramblas like sheep, waiting to be fleeced. I loved the animal/people metaphor. I realized I could punch up that connection. Of course , there is a connection between happiness and the people/animal thingie. Back in Philosophy 101 my professor quoted John Stuart Mill to explain the importance of her topic: It is better to be a human being dissatisfied than a pig satisfied. 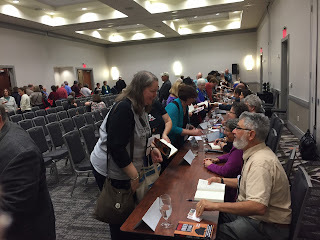 with editor Art obscuring Margaret Maron. any interesting connection between oaks and Spain. There was! And here's the beauty part: the connection has to do with animals. This is the sort of thing that happens when a writer is "in the zone." Things fall into place with spooky precision. It is the sort of thing that makes one invoke the muse or other magical explanations. I only wish it happened more often. So I sent the story in, editor Art Taylor accepted it, and as a reward for his good taste and erudition he was invited to join the ranks of the SleuthSayers. That last part is a joke: his name was brought up by someone who knew nothing about the anthology. But I am glad to be in the book and I hope, well, that it makes you happy. He's a handsome devil, isn't he? I encountered this gentleman in Mobile, Alabama during a very engaging tour of the historic Conde-Charlotte House. Dashing Billy's portrait hung on the wall of the second floor hallway. My brother, Danny, and I were spending a few days in this beautiful old city that began life as a French fort and trading post, and were taking in a few of the sights. Our guide, a lovely lady who treated us as welcomed guests, escorted us from room to room explaining the various periods illustrated by the furniture, paintings, silverware, and creature comforts, each room representing a particular period in the long history of the city. Though Mobile had begun life as a French enclave (and retains much of that flavor to this day), it would, in turn, become an English possession, a Spanish conquest, part of the fledgling nation of the United States; secede with the state of Alabama to join the Confederacy, and finally, return to the fold at the close of the Civil War. As it happened, we were just finishing our tour and preparing to go back downstairs when the painting caught my eye. It had not been remarked upon prior. "Who's this?" I asked, genuinely intrigued by the striking subject in the Native American turban. Our guide grew instantly more animated, raising an eyebrow and saying, "Mostly it's the ladies who notice Mr. Bowles." I quickly assured her that it was my interest in Native American history that drew him to my attention. Brother Danny snorted. 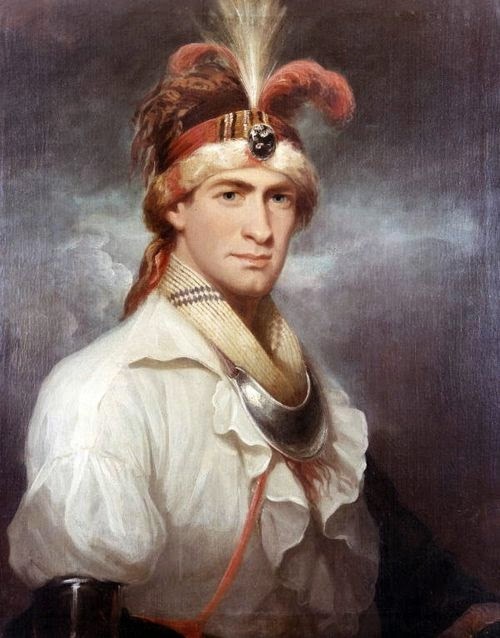 "Well," she went on to explain with a smile, "Mr. Bowles was not an Indian, but he was quite a rogue, and at one time, declared himself chief of the Lower Creeks." Declared himself...? I was hooked...and I think you will be, too. What follows is the very large story of William Bowles condensed for the sake of narrative brevity. There is much left unreported and I beg your understanding. My thanks to Rhen Druhan at the Conde-Charlotte Museum for her invaluable aid. Much of the information here was drawn from a wonderful piece on his life in issue 103 of Alabama Heritage Magazine, as well as other sources. The word scoundrel has many permutations in the English language: When speaking of corrupt politicians we generally intend it as a pejorative. But there's another category of scoundrel that when we apply the word to them, it's always accompanied by a slight, involuntary smile. Yes, we know that they're not very good people, maybe even pretty awful ones, yet...we find them charming, entertaining, larger than life, living more fully than we dare, taking risks that most of us never would. These are the same folks we also use the word roguish to describe, or perhaps, adventurer. We often write about such people and it's easy to think that they're mostly fictional characters. Mostly they are. Then there's William Augustus Bowles. William began life in 1763 as the sixth child of an English family making its home in the colony of Maryland. He was remarkable from the start. Described as an aggressive, vigorous boy with an olive complexion, he excelled at many pursuits. He leaned to speak French, play the flute and violin, painted, was well-versed in mathematics, history, and literature; was, in fact, an avid reader. Besides these artistic and academic qualities, he was a good horseman and all-round outdoorsman. In short, he was gifted with good looks, health, intelligence, and sensitivity. He was also very headstrong as events would prove. His family being fervent Tories during the Revolutionary War convinced young William to join the cause of Britain at sixteen years of age. But after being garrisoned in Philadelphia he found himself cooling his heels for the next several years growing ever more impatient to see action. Hearing that a military ship was looking for volunteers for duty in Jamaica and Florida, William hastened to join. He was commissioned as an ensign and set sail. What happened once the crew went ashore in Florida remains unclear. What is clear, however, is that young William deserted the ranks (he described it as resigning his commission) and made good his escape in the vicinity of Pensacola. Think of it, dear reader, our young hero afoot in the palmetto jungle and swamplands of northern Florida; hundreds of miles from home. He can neither return to Maryland nor go back to Pensacola. He would surely swing either way. But as often seems the case in the life of the daring, the unexpected happens--a party of Creek warriors come upon him and, like many that would follow, are impressed. So impressed by his personality and verve that rather than harm him, they take him along to their village. 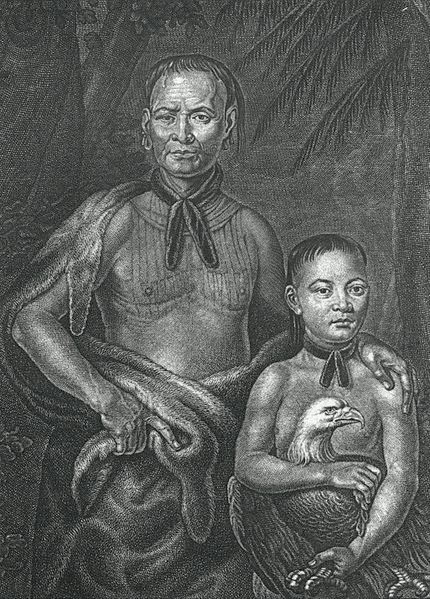 Within a short while he is adopted into the tribe, a tribe that holds sway over much of Alabama, Georgia, and northern Florida, becomes fluent in the Muscogee language of the Creeks, and takes a wife. Always one to live large, William also manages to wed a second lass, a Cherokee, thus uniting two peoples often at odds with one another. Presumably, being William, he also learns the Iroquoian tongue spoken by his second bride. Retaining considerable energies, even with two young wives in his household, he begins his first grand adventure. Learning that the Spanish are attacking British forts along the Gulf Coast, he convinces a number of Creek warriors to join him in the defense of Pensacola. It is certainly a measure of his remarkable character that he is able to lead braves into battle after having lived amongst them for so short a while. In any event, the garrison is lost when a Spanish shell blows up the powder magazine and the fort along with it. Ever a survivor, William flees into the forest with his adopted tribesmen and makes good his escape--a talent of his that would be utilized many more times during his life. 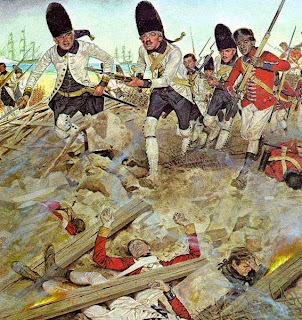 In a sudden reversal of fortune, the British army restores him to the rank of ensign as a reward for his service and valor at Pensacola, and William joins a regiment in New York. Then, in a move that remains unclear, bonny William appears in the Bahamas where he whiles away the balmy days as a portraitist and comedian! It appears his talents know no bounds, though what brings about this sudden change of career, like the move to Nassau itself, is obscure. However, duty calls him yet again; this time in the august personage of the governor of the Bahamas, Lord Dunmore. Having learned of his reputation among the savage races of the Americas, he dispatches William back to the Creek Nation to establish a trading post. Returning to his, no doubt, pining wives, he swiftly sets up shop proclaiming himself Director-General of the Muscogee Nation! Perhaps a bit overblown, but young William is never one for half-measures. There are obstacles. 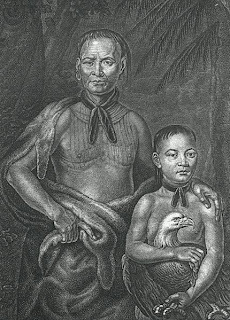 The Spanish, having taken advantage of Britain's long war with its colonies, now controls Florida and the Gulf coast, and with it the trade monopoly with the Creeks and Seminoles. The Director-General, undaunted, meets the challenge with vigor--he declares war on Spain! His Creek allies are somewhat divided on this issue. They have grown comfortable with Panton, Leslie, and Company, the firm that the Spanish have commissioned as their trade emissaries. Besides, the British are losing the American war and their defeat is imminent. Details! Young William decides that Panton and friends must go. Again using his powers of persuasion, he is able to convince the more brash among the young men to support him in a strategy of intimidation and violence against his competitors. Within a short while he has succeeded in making himself the target of His Most Catholic Majesty's ire. In order to bolster his position, William ups the ante once more, telling the Creeks that if they would only recognize him as Chief of All the Creeks, he would see to it that the British Crown recognize them as a legitimate nation and establish an exclusive trade agreement. The people, uneasy with Bounding Billy's vaulting ambition, grow ever more divided and fractious. Yet, he has his supporters; the idea of a separate Indian Nation appeals to many and William's daring is infectious. Traveling to England he makes his bold claims. But for all his trouble and bluster, the government remains unimpressed. There will be no treaty and no recognition of the, so-called, State of Muscogee. He may, however, act as their sole trade representative to the natives. Something he is already doing. This is not what William relates to the people upon his return. Declaring the negotiations a triumph on all fronts, the leader of the mythical State of Muscogee sets in motion the full machinery of war. The Director-General proceeds to outfit two schooners as his navy and organize an army of four hundred Creeks warriors, frontiersmen, and former slaves as his soldiers and sailors. In short order he begins to stock the coffers with the plundered riches and goods of Spain. The store is now open and the British once again competitors in the contested region. The year is 1800. Branding the young upstart a pirate, Spain places a huge bounty on his head and it is not long before he is captured and transported to Spain to face justice. As seems ever the case, the Spanish find William as irresistible as all before them and Charles IV himself(!) attempts to win him over to the Spanish cause. Our Billy's not having it. Whatever he may be--scoundrel, liar, pirate, con-man, adventurer--he is English, by God! Disappointed, no doubt, the emperor has him shut away in prison. By now you must know what happens next--he makes good another escape, commandeers a ship, probably in much the same manner as hailing a taxi, and returns to Florida. But several years have gone by and William finds much changed in his absence: His rivals once more hold sway and British influence has all but vanished. Worse yet, important leaders among the Creek peoples have closed their hearts to him, fearing both his ambitions and judgment. Hearing of an important meeting between both Upper and Lower Creeks William decides to go all in. Gathering his dwindling supporters around him, he crashes the party and does what Brash Billy does best, demands that he be recognized as "Chief of all Indians present"! 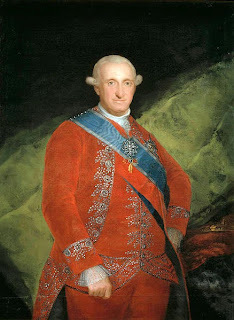 His enemies, knowing William as they did, are prepared for such a move and promptly take him prisoner, handing him over to the Spanish once again. The Spanish having also taken the measure of our hero, on this occasion transport him to the infamous Moro Castle in Cuba to languish. This time, however, there is no escape. Whether he is mistreated, poisoned, or simply dies of neglect we shall never know, but by 1805 Dashing William is seen no more. He is 42 at the time of his death, having spent 26 years living on the edge; his dream of an independent country for his adopted Creeks dying with him. I hope that his two wives, at least, mourned his absence, but history remains silent on this question. Having dared much, he lost it all in the end, and though there is much to be complained of in William Augustus Bowles' character, certainly two things can be said in his defense: He remained loyal to Britain until the end, and he certainly did not lack courage. Loyalty and Valor do not a bad epitaph make.